Before going into animated movies I'm always somewhat apprehensive due to the fact I fear I won't have much to say about them. They are entertainment intended for children and as a result often offer very little in the way of substance and thus not much to comment on. In the wake of Disney animations current uptrend though there was something to be optimistic about in Big Hero 6. Initially, I wasn't as over the moon about the idea of Disney mining more Marvel material so as to fill in their animated films as we have enough super hero movies at the megaplexes as it is. To lose a release from a major studio many look forward to hearing from each year to yet another comic book adaptation is understandably disheartening. At the same time, it makes sense with Pixar slowly losing steam in its winning streak and Disney's singular animation department delivering the one-two punch of Tangled and Wreck-It-Ralph before last years behemoth that still is Frozen. They needed to offset the princess tale with another video-game/male-centric adventure while not excluding any potential audience members. The good and relieving thing about Big Hero 6 though is that once the film begins and the story starts to roll you forget this is supposed to be a super hero movie at all. There are no capes, no grand transformation montages where our protagonist is supernaturally altered and given powers beyond his comprehension, but instead the film focuses on the interests of its cast of characters and their love of science that will inexplicably come off as nothing short of neat to the children in the audience that don't know they crave a more practical approach to the barrage of Marvel productions they've seen over the past six years. It was probably smart for Disney to officially partner up with Marvel and reveal a new legion of fans to a more obscure comic book though and by the end of the film, when the super hero element becomes more prevalent without ever taking over the narrative, I appreciated it moreso for its restraint and patience to tell an actual story rather than throw fifteen minutes of exposition at us before putting our heroes in spandex suits. Big Hero 6, for all its visual glory, is frequently entertaining though unfortunately it does ultimately lack the component that makes Disney films wholly involving and part of our coding. Hiro (Ryan Potter) trains Baymax (Scott Adsit) in the way of karate. In the "futuristic" city of San Fransokyo, which feels more like a rift on our current society or a hyper-stylized reality, we are introduced to Hiro Hamada (Ryan Potter). Hiro is a fourteen year-old child prodigy who graduated high school at thirteen and has since done little with his potential other than craft tiny robots for what is referred to as "Bot Fighting." This underground sport is apparently pretty popular and illegal to make money off of, but Hiro naturally gains a good profit from it with his unique and advanced tech. Meanwhile, his older brother Tadashi (Daniel Henney) is making real strides in life by attending university and working with some of the more prominent scientists in the field at his robotics lab. After being arrested for bot fighting one night and facing the humiliation of being bailed out by his Aunt Cass (Maya Rudolph) Tadashi becomes concerned Hiro will truly end up wasting all of his potential. Tadashi decides to show Hiro what can be accomplished with his intelligence by taking him to the university lab. Here, Hiro meets Tadashi's friends and fellow students, Go Go (Jamie Chung), Wasabi (Damon Wayans Jr.), Honey Lemon (Genesis Rodriguez) and Fred (T.J. Miller), each of whom are working on their own projects that might help improve the world around them. Besides hoping to give Hiro a glimpse of his own, endless possibilities Tadashi also wants to show Hiro what he's been working on and thus we are introduced to Baymax (Scott Adsit). Baymax is a personal healthcare robot Tadashi has designed to help a lot of people and the introductory scenes only give us a glimpse of the hook and anchor that Baymax is to Big Hero 6. Floored by his brothers invention, the atmosphere and the amount of resources available to them Hiro decides he really wants to go to the university. He meets Tadashi's professor and well-renowned inventor Robert Callaghan (James Cromwell) who sees no issue with Hiro's age and encourages him to apply by entering the annual exhibition where he must come up with an invention that will blow the professor away. It is on this night that we see the potential that lies within Hiro while at the same time the events that change the course of his life forever. 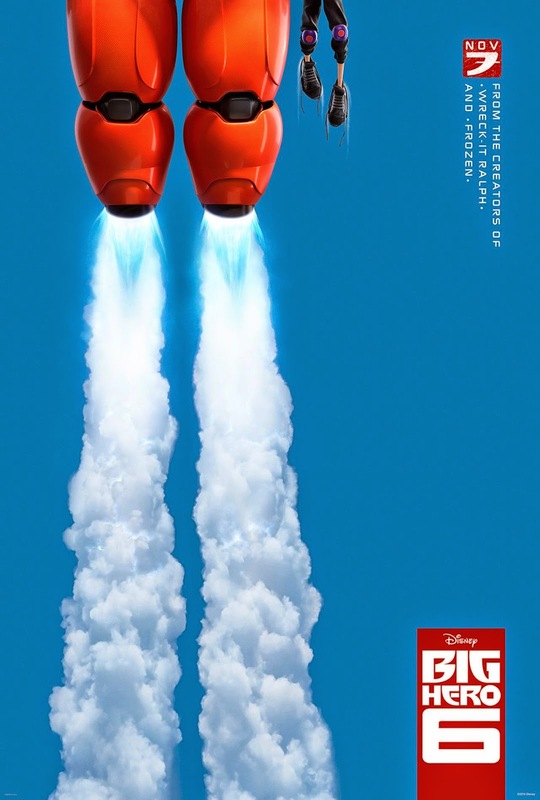 The issue with Big Hero 6 is that its plot gets in the way of its story and characters. Story is the chronological sequence of events, this is true in each of our own lives as we can tell the "story of our life", but the plot is integral to motion pictures because it is the logical structure that connects these events. In movies, these connections have to be tight and almost calculated so as the sequence of events make as much sense to the viewers as possible while typically adding up to something meaningful. The story of a young boy going through a serious trauma and learning to deal with it by leaning on his intelligence and imagination through a token left behind by his older brother is all good and full of possible outcomes, but the way in which the three screenwriters and two "head of story" consultants (none of which are the directors) go about turning the serialized stories of Hiro into one feature length episode results in somewhat of a lazily constructed third act with twists that don't hit as hard as they should. So much time is spent with Hiro for the first half of the film before we are even introduced to the main antagonist that we become invested in him and his story to the point I cared solely about what he'd make of himself. By the time we meet the "man in the kabuki mask" who has stolen Hiro's technology he presented at the exhibition we are still intrigued and begin to look forward to the inevitable outcome that sees Hiro turning himself, Baymax and his new friends into a crime fighting team to defeat said bad guy. To have a convoluted subplot to justify the bad guys actions on top of all of this feels unnecessary. There is a clear need to tie everything together that we know to expect from the get-go and in turn it makes things all the more predictable. It's not that this is necessarily bad storytelling, but it is certainly familiar and the fact there is no solid base established as a pre-cursor to the reveals makes it feel all the more lazy. There is of course one key scene and a few mentions here and there, but nothing that firmly sets-up where the movie goes so that the emotional pay off is truly affecting. Go Go (Jamie Chung), Wasabi (Damon Wayans Jr.) and Honey Lemon (Genesis Rodriguez) fight off the bad guys. Letting the plot get out of the way of the rest of the factors though gives way to a solid if not exceptional ride. The real winner here is Baymax though as I'd venture to say his character was the reason Disney chose to convert this series to the big screen rather than anything else. If all of the young girls were wearing Elsa costumes for Halloween this year it will be Baymax that the boys want to be next year. As a cross between the Michelin Man and the Marshmellow Man Baymax is hilarious in his humble and straightforward nature. The most surprising thing about Big Hero 6, besides its visual prowess which we kind of take for granted in computer animated films these days, is how genuinely funny it is without trying too hard. There are moments of forced laughter that include Hiro, but once Baymax is introduced as essentially the co-lead of the piece he takes over the comic relief duties and he completely endears the audience to the offhand mission that is introduced as the main conflict. It is interesting to see hints of the film giving Baymax more of a personality as if to say there is something deeper here than artificial intelligence. Baymax certainly has a personality, but what we take as characteristics simply come from his programming reacting to the circumstances he finds himself in. There is something deeper to be mined here as Hiro builds a strong connection to the robot, but of course that could all lead back to Hiro seeing Baymax as the last connection he has with his deceased brother. Either way, Baymax is special to Hiro and he quickly becomes the reason we enjoy and stay with this otherwise by-the-numbers animated flick. Baymax is created to give off a non-threatening impression and so it is his humble demeanor matched with the more threatening facade he acquires after Hiro builds him a suit of armor that gives way to much of the humor. I always hate to come down too harsh on animated films because I realize at this point I'm no longer the target audience, but Big Hero 6 really has a lot going for it. The characters are each well defined, the main ideas concerning invention and imagination are clearly expressed and emitted in the look of the film itself, but it is the commodity-like nature of the product that ultimately won't allow it to leave a lasting impression.